Wits to investigate scuffle between security guard, student - SABC News - Breaking news, special reports, world, business, sport coverage of all South African current events. Africa's news leader. 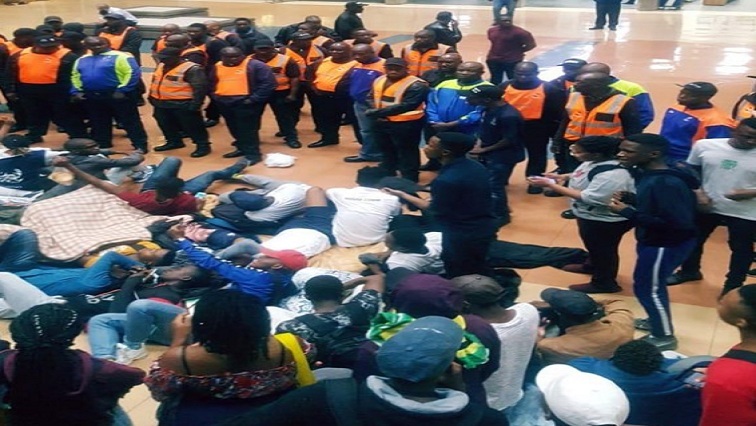 Wits University students and members of the SRC have embarked on a hunger strike demanding that students with outstanding debt be allowed to register and the university accommodate those without accommodation. Wits University management says an internal investigation will be conducted into a scuffle that occurred between a student and a member of the private security company deployed on campus. This follows a video which shows the altercation and has gone viral on social media. Management has denied deploying private security guards to intimidate and victimize students who are conducting a peaceful protest. Students and members of the SRC have embarked on a hunger strike. They are demanding that students with outstanding debt be allowed to register and the university accommodate those without anywhere to stay. The University has also denied claims that it made arrangements with the Student Representative Council that students who owed the university R100 000 or less would be allowed to register. Wits University Spokesperson, Shirona Patel, says the security officers were trying to maintain order when the protesting students started to threaten other students. This entry was posted on 05 Feb 2019,02:57PM at 2:57 PM and is filed under South Africa, News, Homepage Latest Stories Slider. You can follow any responses to this entry through the RSS 2.0 feed. Both comments and pings are currently closed.